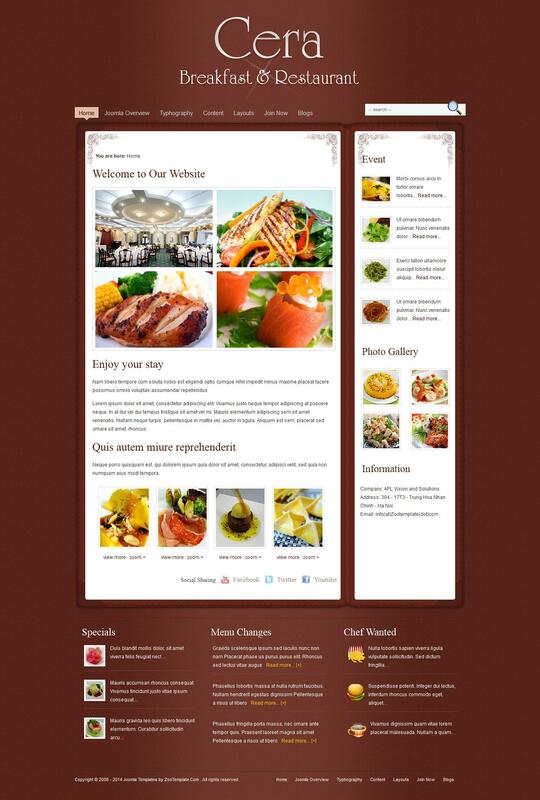 ZT Cera - elegant restaurant theme template from a professional design studio ZooTemplate. Stylish design layout is ideal for creating websites catalogs recipes, business cards, restaurants, bars, confectioneries and projects dedicated to healthy foods that offer delicious lunches in the office with fast delivery. Using a proprietary platform functional and flexible modular design, in combination with additional extensions will create a quality website as soon as possible. There is support for mobile and tablet devices, fast loading pages and having a well-optimized code for search engines. Support component catalogs K2 able to add new features and capabilities in the publication and posting materials on the site.